Our latest Swindon Advertiser column is reproduced below. Visit the Swindon Advertiser website for the original article. THE months keep flying by and it’s easy to forget the mountain of work we put in last year, when after our March AGM we asked the question ‘Should supporters try and buy the County Ground?’. But it’s very clear from our recent discussions that the Trust board are more determined than ever to give supporters and locals a chance at community ownership of our much-loved stadium. Last year we held further public meetings, a discussion with the Goddard estate around our plans for the area, as well as numerous other meetings around development of the stadium. We had plenty of positive media coverage before our campaign lost momentum for reasons out of our control, namely Swindon Town’s own interest in the stadium, which gave the local council another option to consider. 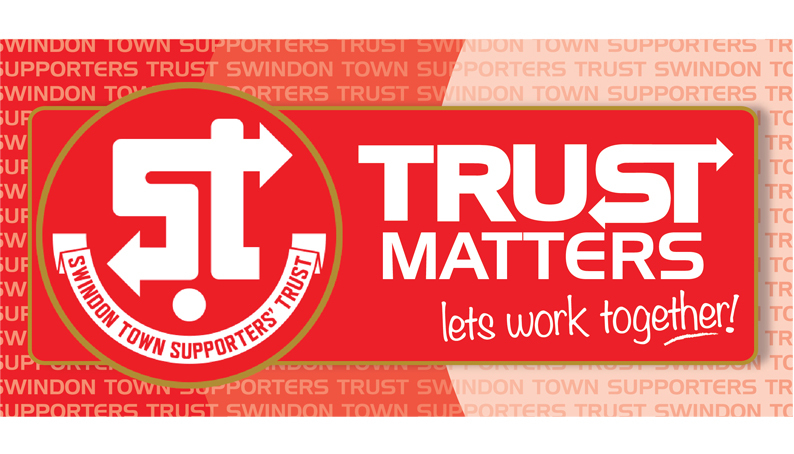 In January, we passed a confidential letter from a third party to Swindon Borough Council confirming that every supporter pound will be matched up to £1m through a donation agreement. Remember the goal here is not for the Trust to own the stadium – it’s for the supporters to own the stadium, through Community Shares. Nobody will have a stronger say than anyone else, no Trust board member and certainly not our matched funding partners. This will always be a genuine community bid. As Town fans we are fully appreciative of the current council ownership of the stadium. It has served us well for 125 years, but it’s plain to see that developing and improving the ground that they own is always going to be an issue. It’s just not realistic to expect the non-football fan taxpayers in the town to contribute toward development and improvements, when such a relative few of the population go through the gates on a Saturday. Many supporters speculate that we are in competition with Lee Power and Swindon Town Football Club. But in truth, we are constantly trying to open up the communication channels. We respect the situation, support the club and can publicly state that our door is always open for a friendly, positive and supportive conversation. We simply want to move things forward and also protect the fans of the future. There are so many sad stories of football clubs who have had troubles related to their grounds, and we never want that to befall our own club. Just last month the Football Association and the government announced a review into the ownership of football stadiums to help protect the interests of English clubs. We are talking about long-term legacy, be it 10, 50 or even another 125 years down the line. Once the stadium goes into private football club ownership, it’s gone forever and can be used as collateral for loans. That means debt that could one day get us into huge trouble. Under council ownership we have always been safe from that. The only safe alternative to council ownership is the supporters, led by the Trust. If we can get this to happen, we would never stand in the way of other people wanting positive developments to the stadium. As supporters we would always be realistic and understand that those developments require investment and a handsome level of payback. This can be worked out with the current club owner Lee Power, or any other future owner, even if it’s a Russian oligarch! The other key point is that no individuals will benefit from the community owning the stadium. Every penny brought in will be reinvested back into the football club, one way or another. This is good for the football club, and for the fans. We’ve already met with a very exciting company who want to build a new Town End stand for us and provide excellent facilities for the whole Town to enjoy. Just last month they confirmed that Swindon is their number one choice for a showcase development, so even if the council decide not to sell the County Ground, then we will be lobbying for further discussions on the matter. 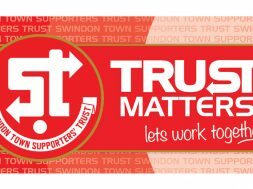 The two opposing bids situation is not ideal but with lines of communication open, we continue to strive for a positive working relationship with Swindon Town and to find some way in which supporters and club can work together. We must try and leverage the capabilities of both the club ownership and also the supporters. Unfortunately, there is a lot of apathy within the supporter base at the moment and that is more dangerous than anything else, because when people stop caring, they lose all interest – often forever. Many will always give undying love for the club and keep attending no matter what, but even those supporters must accept that many fellow supporters feel disconnected from the club and that is a bad thing. We need to do something – soon. 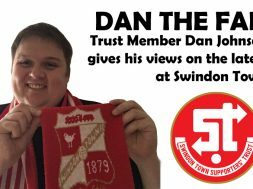 If our club’s leadership and supporters could join forces, it would bring a feeling of togetherness and community that would really strengthen Swindon Town Football Club. Supporters owning their own stadium and planning its future, looking for investments together and with the club, will bring no end of opportunity and it will help us to reconnect. We’ve had several new board members join us. Dan Hunt as taken over our Twitter feed, along with local solicitor Adam Tanner and accountant Keith Coatsworth. They are ardent Town fans and bring a fresh outlook from ‘the real world’ outside of our Trust inner circle. It’s clear from their first meetings, where we were able to share detail on some of the more confidential matters, that they have a sense of the frustration that all of our hard work has not yet come to fruition. We have been in limbo as we wait for the dust to settle post-elections and we don’t know what will happen when the council finally sit down to decide the fate of the County Ground. The main drawback to our bid is the current Catch-22 situation we find ourselves in. Despite our matched funding donation of £1 million, we can’t start our £50k crowdfunding campaign until we get the signal from Swindon Borough Council that they will sell to us – and the council seemingly can’t confirm they will sell it to us, unless we have all the money in place. We appreciate this is a difficult situation, but in our defence, it’s really quite simple. True democracy – if supporters and locals don’t want to own the stadium, then they won’t contribute – if they do, they will. We simply want the council to give locals and supporters a six-month chance to raise the funds. The Asset of Community Value status on the County Ground dictates that at the moment the stadium is officially up for sale, a six-month window needs to be opened so that our community group can put in a bid – so it’s a perfect fit. Despite many obvious flaws in the current relationship, if we were successful we would continue to hold our arms open and look to build bridges with the football club to work together toward a brighter future. It’s the County Ground’s 125th anniversary year, and we’re soon to see the 50th anniversary of our League Cup success at Wembley. That would be a perfect time to start afresh and get Swindon Town fans back together behind one fantastic common cause. next Is the current Swindon squad deep enough to sustain a League 2 promotion push?